Cutaway - The three major zones of the Sun's internal structure are shown in this cutaway of an EIT 304 image. 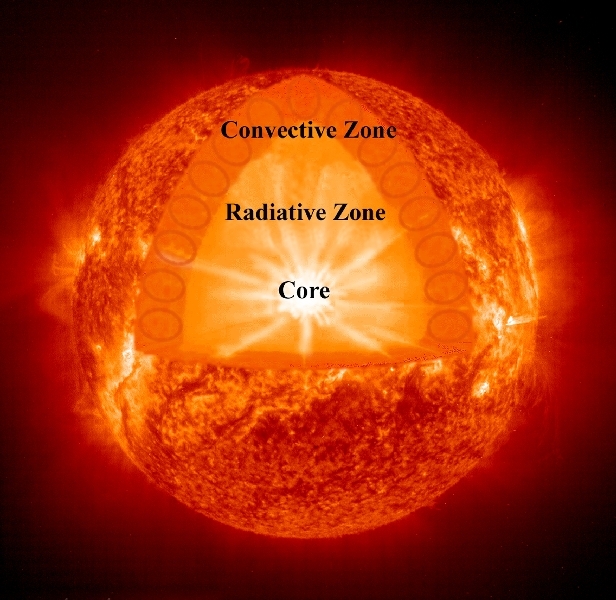 The core (temperature of 15 million degrees) is where the nuclear fusion occurs. In the large radiative zone the plasma and energy are gradually moved outwards from the core over a period of thousands of years. Finally, the hot plasma is cycled through a convection process (represented by the series of circles) in the convection zone up to the surface and out into space.